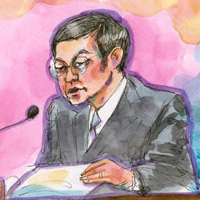 On the eighth day of trial, Hak-Shing William Tam, an official proponent of Proposition 8, was called as an adverse witness by plaintiffs. He testified about the messages he disseminated during the Proposition 8 campaign. Watch George Takei reenact William Tam’s testimony during the Los Angeles premiere of “8” the play. “[BOIES]: (Continuing) — okay? You may think they shouldn’t have it for all sorts of reasons, but you recognize that that’s important to those children, correct? “[BOIES]: Now, do you believe that homosexuals are 12 times more likely to molest children? Do you believe that? “[BOIES]: Okay. Now, [on your website] you go on to say that: ‘If Proposition 8 loses, one by one other states would fall into Satan’s hand.’ Do you see that?“[TAM]: Yes. “[BOIES]: And by falling into Satan’s hand, you meant permitting gays and lesbians to marry, correct?